Colonia Intensa, a masculine tribute to the universe of Colonia, stirs the senses through an innovative leather accord. Top notes of Calabrian bergamot and Sicilian lemon, enriched with refined freshness by vibrant notes of cardamom and ginger. Refined aromatic heart notes of myrtle and sage mingle with hints of Neroli and intense base notes of leather, cedar, and patchouli. Deep notes of Benzoin and Musk exalt the persistence of this refined harmony. Made in Italy. 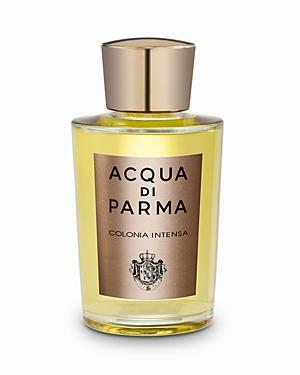 Acqua Di Parma Colonia Intensa Eau De Cologne 6 Oz. Acqua Di Parma Colonia Leather Eau De Cologne Concentree 3.4 Oz. Acqua Di Parma Colonia Intensa Oud Eau De Cologne, 6 Oz.